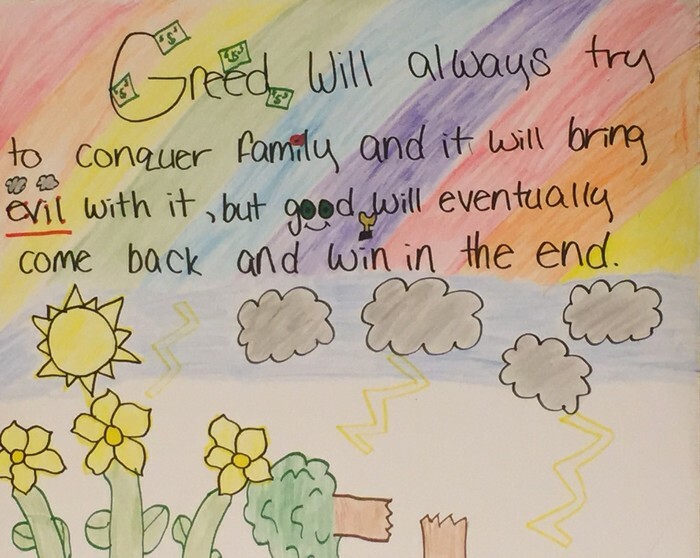 Theme Found in "The Pearl"
Greed will always try to conquer family and it will bring evil with it, but good will eventually come back and win in the end. This poster is here to show how the pearl once made Kino and his family happy, but then destroyed his family. The songs that Steinbeck mention in the book are evil and the song of the family soon became evil. Kino is very greedy after he finds the pearl. He thinks that the pearl will give him everything and his family will happy. Kino begins to become avarice and the evil he brought to his family hurts them in many ways. Juana wanted to get rid of the pearl, but Kino didn't. After Kino killed a man and ran away, trackers began following them. Coyotito was shot in the head and Kino realized that the pearl brought his family evil. He brought some good back to his family by going back to their town and throwing the pearl into the ocean. A lot of the time Kino thinks that selling the pearl will make him and his family a lot happier. Money can't buy happiness, it only destroys what's already there. My work of art is about how greed brought evil towards Kino's family, but some good finally came out of it. In the picture, a storm is destroying the flowers and the tree, which represent a family. I used the storm to represent evil in "The Pearl." Even though the tree is broken, a rainbow came out because the sun still shone through the sky. No matter what happened, the sun still came out and good came out of the storm. In the book, Kino was greedy and the pearl brought evil to his family, but in the end he did the right thing and threw the pearl back into the ocean. My art shows how things in life can fall apart, but can always be brought back up. In my life, bad things have happened as I'm sure bad things have happened in everybody's life. All humans are greedy and I've been greedy before. The things I've done to get what I want are evil and that brought a lot of evil to my family. Although these things have happened in my life, I've always been able to make it up to my family and bring good out of it.